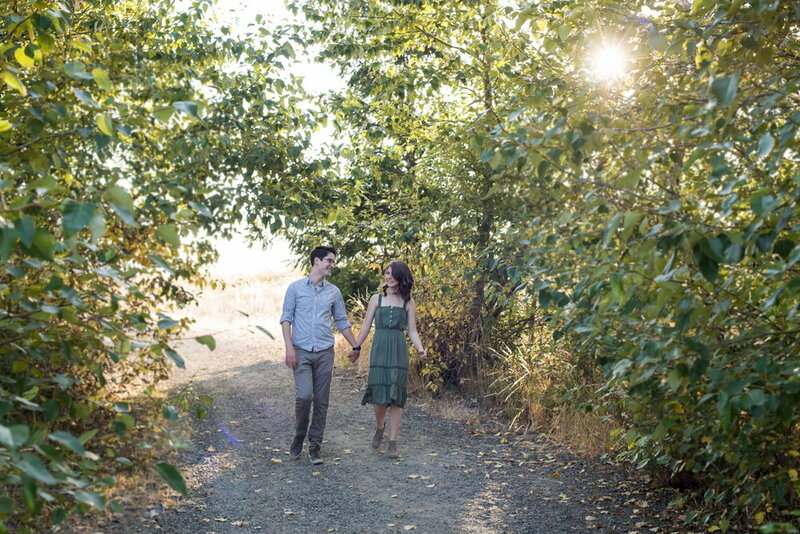 Recently I was lucky to shoot an engagement session at Powell Butte with Grace and Thomas. We met on a warm Summer evening at a large nature park with dense woods and open meadows. I had been excited to shoot at this location for awhile and when Grace mentioned they wanted somewhere scenic but not too far away from downtown Portland, I knew just where to go. I know that my clients aren't professional models and I regularly hear concerns about feeling awkward in front of a camera. For me, it's not only important to take great photos of my clients that are flattering but also create an experience and an environment that sets my clients at ease during their shoot; engagement sessions are great for this. These sessions are such a good opportunity for me to get to the know the couple aside from the hustle and bustle of their wedding day. They also allow my clients to get to know me and see how I work. During an engagement session, I work with my clients to find poses that are natural and comfortable all while exploring beautiful scenery and having a fun time together. My session with Grace and Thomas started with a meander through a grove of shady old trees, which provided a backdrop for vibrant photos with soft light. As our shoot progressed, I was able to get some great shots of the two looking out over the scenic vistas of Southeast Portland. Grace and Thomas, were easy to work with and fell into natural poses that highlighted their comfort and ease with one another in front of the camera. Best of all they were down to hike, explore, and find all of the nice light. Photographing Grace and Thomas on the hillsides and overlooking the vistas of Portland was a perfect way to capture the beautiful simplicity of two people who really care about each other. I wish these two all the happiness as they start their life in the Pacific Northwest together! Why should I take professional headshots? Getting a bite to eat? You probably open up an app and check out pictures and reviews of the restaurant. Thinking of doing some shopping? Take out that smart phone and look at images of what the local boutique has to offer. Scheduling a doctor’s office check up? You can browse through the staff photos to see who is taking new patients. Images on the screen, whether on your laptop or on your phone, help to create visual representations of businesses, whether you are a freelance writer, a fitness professional, or a nonprofit organization. In order to make the best decisions, we all want to see photos, lots and lots of good photos. Having a set of professional headshots to add to your social media can add a fresh perspective to your online presence. I’ve worked with illustrators, healthcare providers, artisans, and burgeoning fitness professionals to help them create a gallery of bright, vivid, and visually attractive photos to bring some fun to their websites and social media. I love what I do and want to help you elevate your business so more people can love what you do. For more information or to book a session in Portland contact me today. 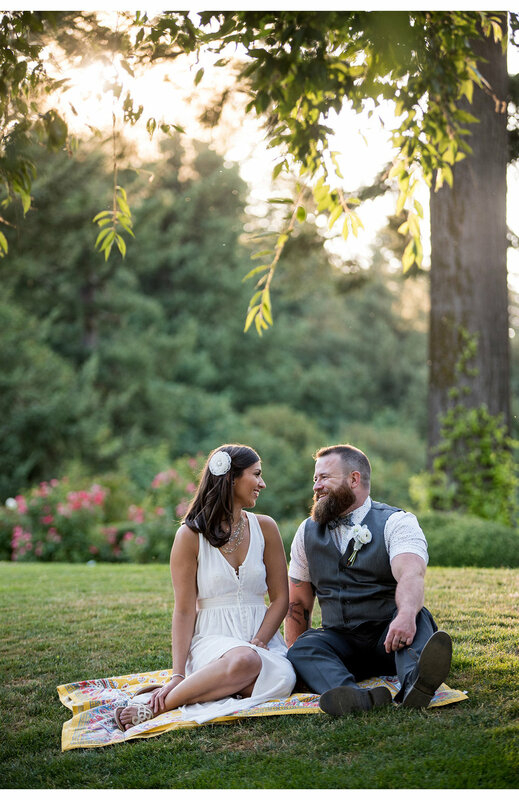 Shannon and Sean are a lovely, easy to work with couple and I’m so happy that all seemed to align to bring this Michigan based pair to have a wedding at the Multnomah County Courthouse in downtown Portland, Oregon. This shoot was a great opportunity to see the city through the eyes of a visitor and to get some really good photos that not only capture the love between these two, but also some of the highlights of the many faces of the Pacific Northwest. It can be easy to fall into the rhythm of your city, head down, following your daily routines, somewhat oblivious to your surroundings. 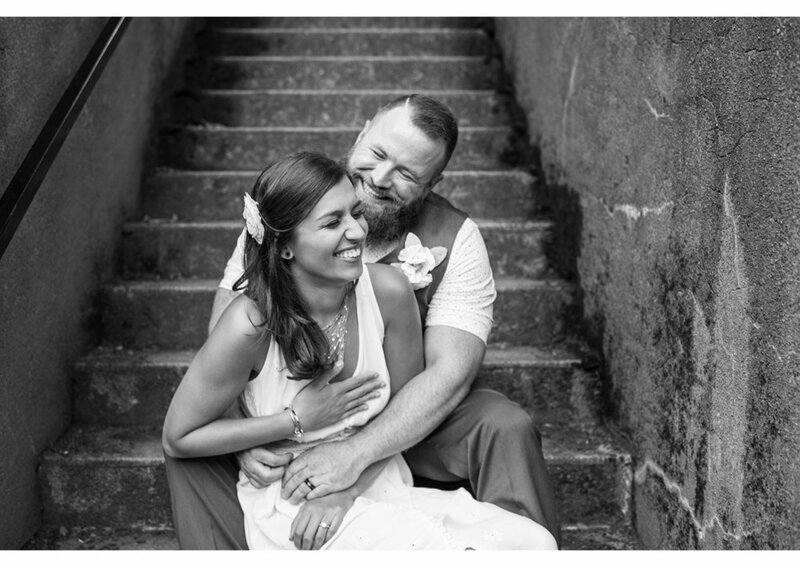 However, sometimes a gentle reminder, which for me came in the form of an elopement shoot, can serve as a great reminder of the natural beauty that is at our fingertips in Portland. 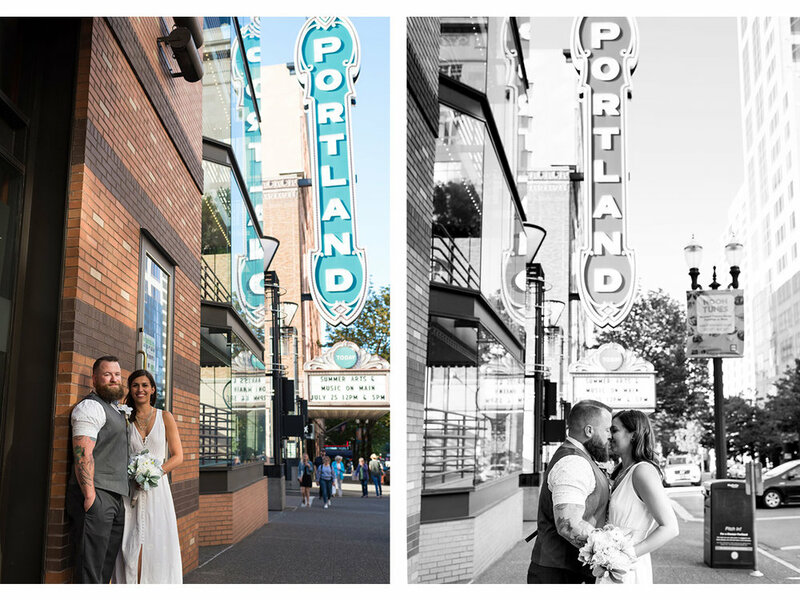 With their wedding party in tow, we were able to capture natural light portraits of the couple and their close friends outside of the Multnomah County Courthouse and the surrounding area, and we couldn't resist shooting under the Portland marquee at the Arlene Schnitzer Concert Hall. One of our favorite downtown scenes was shot in a somewhat unexpected space, under the blooming trees outside the façade of the Edith-Green-Wendell Wyatt Federal Building. Shannon and Sean were great sports as they soaked up the sights and received a continuous stream of congratulatory shouts from the downtown passerby. After catching a few of the iconic spots downtown, the group traveled to Pittock Mansion to capture a different side of Portland. We got some great group and couple shots on the Wildwood trail, while also capturing inspiring frames of the couple overlooking the city. I’m grateful not only for the opportunity to meet this couple and their friends, but also for an opportunity to fall in love with the city again. I only scratched the surface of photo shoot worthy locations in Portland and can't wait for future shoots. If you're planning a Portland elopement or courthouse wedding of your own, I’d love to hear from you! See more of my work here and drop me a line!